Getting your home's air ducts cleaned periodically can go a long way towards improving how healthy your house's environment is, as well as helping to ease energy costs. This service is particularly of importance if you have smokers in the home, pets, or other factors that negatively impact the air quality. Even without those detractors, the air that's brought in from outdoors will still pull in dirt and other substances that will contaminate the air and slow its flow. That's why regular cleanings are so important! If your air ducts are choked up with years and years of dust and otherwise that have built up and never been cleared out, then it's highly likely you'll notice that your energy bill is higher than it should be. Slow airflow due to contamination means your system needs to work harder and longer. Getting the dirt cleared out will drastically improve energy efficiency! Contaminates residing in the duct will pollute the air continuously as it passes through and harm the quality, which can negatively impact anyone inside your home. This is of particular concern for anyone with breathing conditions such as asthma, as well as children and the elderly who are more susceptible to breathing troubles. Even without these factors, healthy people will find themselves fatigued from the poor air, and the allergens involved will aggravate allergies as well. We'll be out at a time that's best for you to take care of everything! We use the best tools available to get your air ducts completely clear of blockages by dislodging them and sucking them up with a special high-powered vacuum therefore avoiding cross contamination. 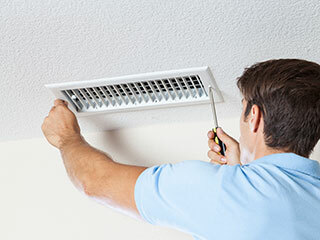 Call Air Duct Cleaning Richmond and take the first step towards fresher air now!